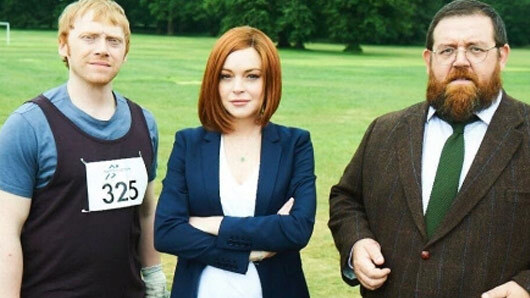 Lindsay Lohan will join Rupert Grint and Nick Frost for Sky 1 comedy Sick Note series two. The Mean Girls star will portray Katerina West, the daughter of protagonist Daniel’s (played by Grint) boss. Sky’s Head of Comedy Jon Mountague said: “One lie leads to the next in this unsettlingly brilliant comedy that will hook viewers in and have them on the very edge of their seats. The news comes despite the fact that Sick Note‘s first series has yet to premiere on Sky 1. Series one is scheduled to debut in the Autumn. It follows Daniel Glass, a compulsive liar who is at a dead-end at work and in his personal life. His life gets even worse when he is diagnosed with a terminal illness by incompetent Dr Glennis (Nick Frost), only to learn his diagnosis is a mistake. With that, life becomes a hilarious spiral of lies as Dr Glennis convinces Daniel to lie about his friends, family and colleagues about his misdiagnosis. Sick Note will air on Sky 1 in the Autumn.